A bridge is one of the few options that you have when deciding how to deal with a missing tooth or teeth. The replacement of these missing teeth is necessary in order to maintain the proper mouth functions. Tooth loss can affect the way you eat, speak, and the alignment of other teeth in your mouth. A bridge, by definition, is a link or connection between two permanent structures. A dental bridge is very similar in that it attaches the restorative teeth (bridge) to the natural teeth on either side of the gap. This bridge acts as your new teeth, closing the gap and restoring your smile. Bridges are often constructed of gold or metal foundations with porcelain fused to the foundation. This ensures that the bridge will support the normal functions of the mouth. Traditional bridges involve creating a crown for the tooth or implant on either side of the missing tooth, with a pontic in between. Traditional bridges are the most common type of bridge and are made of either porcelain fused to metal or ceramics. 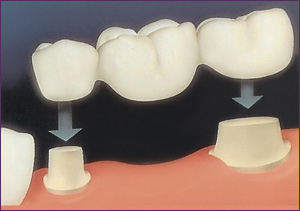 Cantilever bridges are used when there are adjacent teeth on only one side of the missing tooth or teeth. Maryland bonded bridges (also called a resin-bonded bridge or a Maryland bridge) are made of porcelain teeth and gums supported by a metal framework. Metal wings on each side of the bridge are bonded to your existing teeth. The procedure begins with preparation of the natural teeth, or abutments. We will shape the abutment teeth so that the ends of the bridge will fit comfortably on each one. The next step is to take an impression of the area. This impression will be sent to our lab where your new restoration will be crafted. While this new tooth is created, we will provide you with a temporary restoration. Our temporary restorations will resemble your natural teeth so that you can continue with your daily life without worrying about a missing or unattractive tooth. During your second visit to the office, we will proceed with the placement of your final restoration. This bridge will be fitted comfortably into the mouth. We will make every effort to ensure that the new bridge feels exactly like your natural teeth. The final step in the process is to cement the bridge into your mouth, leaving you with a beautifully restored smile.